Target 1 Cyberse monster you control; banish it, and if you do, add 1 Cyberse monster from your Deck to your hand, whose ATK is lower than that monster’s original ATK. During your next Standby Phase, return that monster banished by this effect to the field, and it can attack directly that turn. You can only activate 1 “Cynet Backdoor” per turn. Cynet Backdoor is a Quick-Play Spell for the Cyberse archetype that can do several things for the archetype. Lets break it all down. Capable of rescuing a Cyberse monster on the field, good to protect your Cyberse monster from a boss monster, save it from a stronger ATK, or avoid a banish or destruction effect your opponent has, or that you use (Dark Hole). After the banish you get a search for a Cyberse with lower ATK than the one you banished. Good for a deck that runs a few Cyberse monsters. There are some higher ATK Cyberse monsters and you can fetch something small. 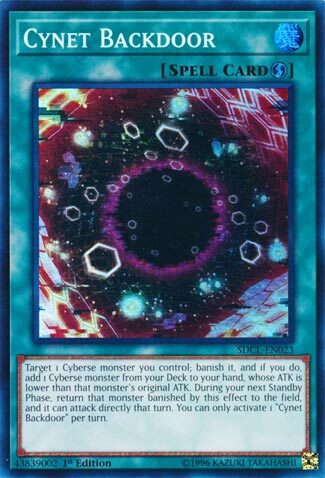 The problem with this effect is that the best part about banishing a Cyberse monster is that it may be a Link Monster like Firewall or Proxy Dragon. When it would return, it would free up your Extra Card Zone, allowing for another Extra Deck summon. If you use this card you’ll need those weaker Cyberse monsters if you play this on something like Firewall. The final effect returns that banished Cyberse and it can attack directly the turn it comes back. This gives Cyberse players a tremendous advantage, being able to play this card once per turn, during either players turn because of its quick-play status. Activate one during your turn, then during your opponents turn, and you have two searches to replace the Cynet Backdoors you used, not to mention two Cyberse monsters able to attack directly the turn they come back. For dedicated Cyberse players this is a tremendous support card they needed to help their decks. For all other players, its a nifty card that could see some use if decks ran some Cyberse tech options like Dotscraper, Lockout Gardna, or Backlinker. Advanced-2.5/5- A solid 5/5 in Cyberse Decks, but its power is halved outside the archetype due to the requirements needed. I once said that Cyberse had a better search card than Cyberse Beacon and here it is, Cynet Backdoor. Cynet Backdoor is a Quick-Play Spell, the best kind, that lets you banish a Cyberse until your next Standby Phase, and when the monster is banished, you can search for a Cyberse with less ATK. Also when the Cyberse returns, it can attack directly that turn. This card is a hard once per turn. The search is nice, and it can help prevent spot removal on a certain monster you have. Also being able to attack directly if needed is good to get in damage to go for game if your opponent has a full board. A great searcher for the deck, though now once again I feel the next Structure Deck for Cyberse will have a better searcher than this. Still, this is worth playing in a Cyberse deck just to save important Link Monsters from spot removal if they have arrows pointing Left and/or Right.